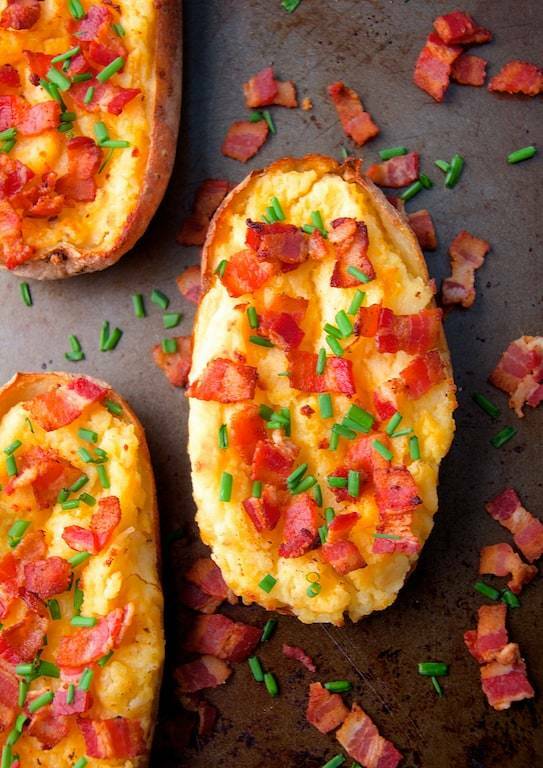 Perfect Cheddar and Bacon Twice-Baked Potatoes are pillows of potato perfection! Preheat oven to 375 degrees. Scrub potatoes and blot dry. Pierce in 8-10 places with a fork and place directly on oven racks or on a baking sheet, Bake for 1-1 1/2 hours or until easily pierced with a knife. Cut the potatoes in half lengthwise and scoop the pulp into a potato ricer, leaving a 1/8-inch thick shell. Press pulp into bowl. Immediately fold in the melted butter then add half-and-half and buttermilk, cheese, salt and black pepper to taste. Be careful to not over-mix. Scoop the filling back into the potatoes, top with more cheese if desired and return to the oven for 30 minutes or until heated through and potatoes begin to lightly brown. Top with bacon and chopped fresh chives and serve.